Sobering times for Liverpool fans – a season ago, we were celebrating how Kenny Dalglish, with the mantle of Messiah, seemed to effortlessly restore us back to form, after Woy’s charges suffered 5 defeats in the last 8 league matches. But before you bring out the white robe and sandals for the King, even after the victory at Ewood Park this week, Liverpool’s run of 6 defeats in 9 is comparable to Hodgson’s record, which means for 2 seasons in a row, we’ve been talking – sacrilegiously – about the infamous 1954 season, the last time Liverpool were relegated (and 1 of only 3 occasions it has happened). I myself am perplexed – and stubbornly trying to believe in Kenny and his squad, but I’m sure I’m not the first Liverpool fan who’s questioned the Anfield legend this season. There is a touch of irony about this – after all, it was Liverpool fans that (vehemently) made it clear they would have preferred Kenny to Woy a season ago from the start. Liverpool fans have got what they wanted… or so we thought, right? FSG were merely responding to the yearnings of fans that place their trust in the last man to take us to the promised land of 1st place. But perhaps FSG, in retrospect, showed naiveté – and this is not the only decision that I feel they’re lacking direction on. Another sobering thought. It’s 18 MONTHS since October 2010, when FSG completed “the epic swindle” and purchased Liverpool Football Club from Hicks and Gillett. I emphasise the timeline, because it’s a long time to own a club and not outwardly deal with the elephant in its room. I am, of course, talking about a new stadium. Anfield. Stanley Park. All three. Don’t get me wrong, I appreciate the logistical issues that may exist, from relevant council or local government approvals, complex deals to arrange building contractors, and all sorts of related things I know little about. To be honest, I’m sure most Liverpool fans will share my attitude that these issues, while important – pale in comparison to the significance of the delay, or lack of action. A quick glance at Liverpool’s total revenues (check the Deloitte Money League reports for sources) illustrate a bleak picture. Liverpool’s ability to generate footballing revenue – whether fairly compared or not to clubs with large sources of readily available cash (wearing blue, mostly) – are dwarfed dramatically by England’s elite (and yes, I don’t like to describe Manchester United that way). The graph above compared against other European powerhouses like Barcelona and Real Madrid makes for a worse image. Why is this important? Simple. Footballing revenue ultimately empowers a club to purchase, employ, retain, reward (etc) its most critical asset – players. 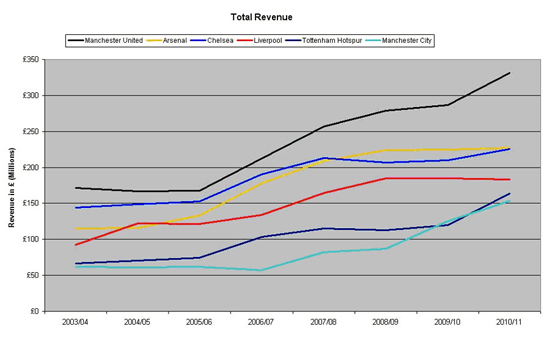 And in revenue terms, Liverpool doesn’t stack up well at all. What is revealing about the graph above is not only where Liverpool ranks, it’s also the extensive growth of Manchester United, the growth of Spurs and City, and the plateau of Arsenal and Chelsea. 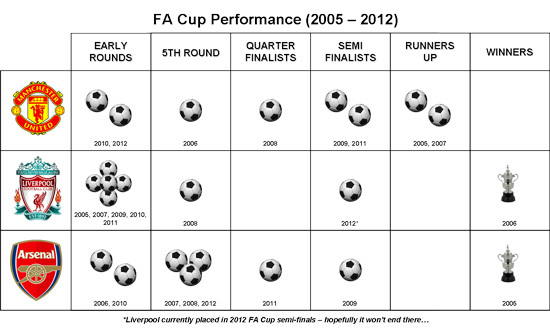 Only Liverpool is heading in the wrong direction. Clubs have 3 core sources of revenue – matchday (good old bums on seats), broadcasting (TV coverage – and typically, the more matches, and the more significant the matches, the more money), and lastly commercial (everything from shirt sales to sponsorship deals). 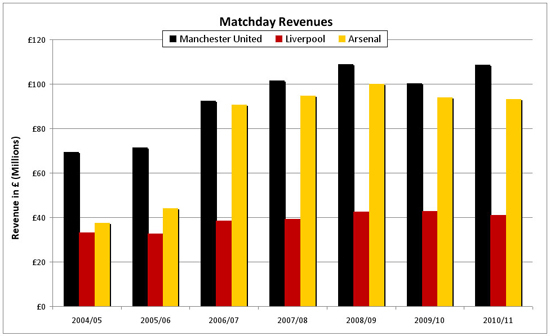 So let’s consider a comparison – Liverpool to their original traditional rivals Arsenal and Manchester United (an appropriate comparison I feel, in the context that while Chelsea and Manchester City possess financial strength as well, much of it comes from some very wealthy owners who can afford to make extensive injections to progress those clubs very quickly in a short time - and let’s be honest, Hicks & Gillett were, and to a lesser extent, FSG, are not those types of owners). I draw a few conclusions. A current gap of nearly £150 million in available financial muscle between us and our largest rivals isn’t going to help us beat them on the pitch in trophy counts. The gap speaks to – for example – the ability to attract quality players. Liverpool lost out in signing Phil Jones and Ashley Young (as examples) in the summer. It could have been about Champions League football, or wages, or both. 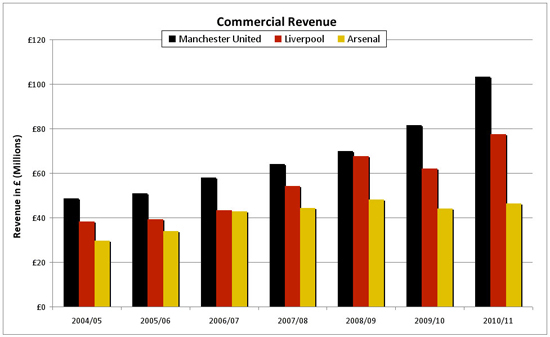 Both Liverpool and Manchester United have doubled (just about) their commercial revenue between 2005-2011. Liverpool’s recent sponsorship deals with Standard Chartered (£20 million per year) and Warrior Sports (£25 million per year) are comparable to Manchester United’s deals with Aon (£20 million per year) and Nike (£23 million per year). It’s when you start looking at matchday revenue, and consequently broadcasting revenue, that Liverpool’s finances show critical cracks. 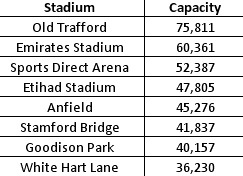 In 2006/07, Arsenal moved to the Emirates and 22,000 extra seats effectively permanently doubled their matchday revenue (check the table below for seating capacities in England). 2012/13 will be Manchester United’s 5th year of enjoying £100 million from their stadium alone. Liverpool’s matchday revenue has yet to break the £50 million mark in its recent history. So while Anfield may be a special place – it’s going to take a great deal more singers in the Kop to bring the money that would be music to the club’s ears. 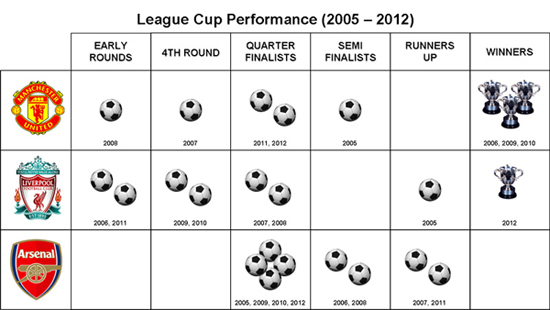 The results speak for themselves; Manchester United have displayed an uncanny consistency of getting into the final 4 in most competitions in recent years. 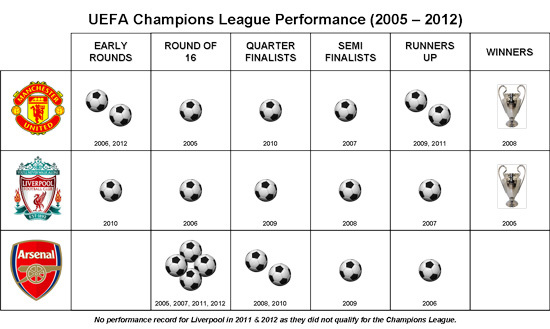 Arsenal seems to be a perennial quarterfinalist, while Liverpool is less consistent. If you compare these performances to the broadcasting revenue, there are a couple of interesting observations. 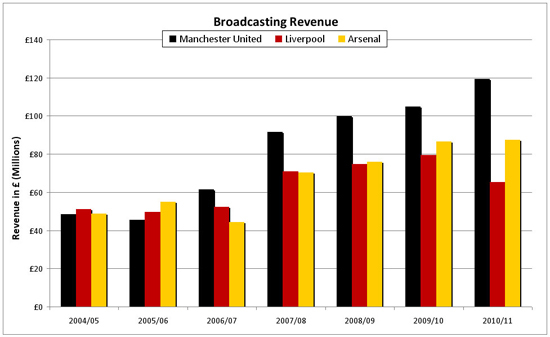 The broadcasting revenue gap between Liverpool and Arsenal is negligible, until 2011 – the first full season without the Champions League. Manchester United and Arsenal only failed to reach at least the quarter-finals across all 3 competitions on 17 occasions (combined) – Liverpool have failed to do so 14 times in the same period. You also need to consider how this impacts matchday revenues as well, because of matches played at home in these competitions. The Champions League especially, with its two-legged format, offers a double whammy of revenue, because a home game is always involved. So it tells us something we already know – even though this season’s domestic cup success will (ironically) minimise the gap in Champions League TV revenue loss, it won’t be made up by much. Matchday revenues will also be undermined by our smaller stadium – although bizarrely, we played 1 home game in our Carling Cup run, and 4 home games in our FA Cup run. Tellingly - Arsenal may have fewer trophies in the cabinet, but they have the right idea about the importance of the top 4. Manchester United’s broadcasting revenue this season will collapse dramatically due to early exists across the board (but they’ve had a decade to build up some fat to absorb this). In fact, Manchester United’s performance, stadium size and commercial revenues across all fronts have configured the club’s revenues well enough to compete financially even if certain teams in blue do have access to other, “slicker”, sources. Clearly they’ve won the trophies anyway. So conclusion time. It’s a simple equation: bigger stadium = more money. More money = better players. Better players = better performance. Better performance = more money. More money = better players. And so on! But it all starts with a stadium. Which brings us to FSG again. 18 MONTHS. Given the reasons above – is it reasonable to expect that a year and a half has passed since they took ownership with no progress on the stadium issue? Have we all been taken in by the tepid romance of Kenny’s reign that we’ve failed to notice the huge problem that Anfield currently represents? What is FSG’s plan and intention? If they haven’t done anything yet – when will they do something? If this isn’t a priority, why isn’t it? Because it stands to reason that I certainly don’t expect more £100 million transfer kitties for Kenny to spend. If the “traitors” amongst us are to be believed and we need to oust Kenny in favour of managers of Mourinho or Guardiola’s calibre, I ask you – do they not spend money with their clubs? With our goalscoring problem, wouldn’t it be nice to go after bench warmers like Dzeko or Defoe, or loaned superstars like Adebayor? I doubt we can afford them, let alone go after better. Again – this is a long term road back to the top – and it starts with a stadium. Anfield. Stanley Park. Whatever it may be. It begs the question – Hicks & Gillett didn’t give Rafa the full transfer kitty he wanted – but he got to spend money, no question. FSG have done the same. Do we have another set of overpromising owners? This is an excellent analysis of revenue, but I don't see anything about the cost of the proposed stadium. How much good will it be if ALL of the new revenue is eaten up paying for the extra seats? Do you really need to preserve all of the slum housing around Anfield? A new stand or two would be cost effective, but to build a whole new stadium for stadium for 15,000 extra seats? Do the math. @ jhollow - absolutely agree with you around the cost implications, they are serious. The problem remains competing at the required levels, however. When UEFA's new financial rules come in, I would imagine Abramovich & Mansour can't throw money around without "disguising" it in naming rights for their stadiums. 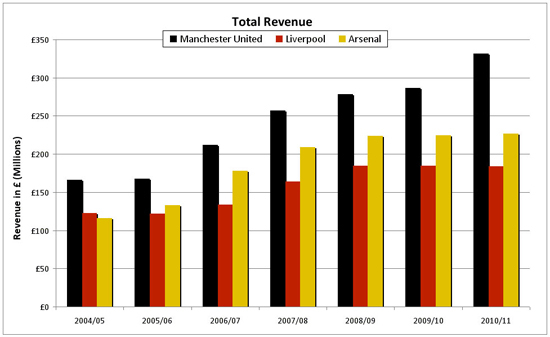 Man United & Arsenal are pretty much self sufficient (save for a debt or two). We have neither overly rich owners or a big stadium, so something has to give. I don't know the solution, but it's a big problem, and it could get bigger. Where's Them Frikkin' Lazar Beams?? Is Fejsa the missing piece of the Benfica puzzle? Could the trip to Olympiakos be Benfica's most critical game of the season? Is it Benfica’s Title to Lose? © 2012, Marco Lopes. All images sourced via search engines - contact me if they must be removed. Awesome Inc. theme. Powered by Blogger.